This work is part of an ongoing technical and artistic exploration of feedback-based processes. It represents a refinement of some of these techniques into a form which is minimalistic in its algorithmic structure while – like an early Steve Reich phase piece – beguilingly complex in its perceptual effect. In contrast to the pervasive feature-creep that can infect software development, much of the process behind this work is concerned with the removal of elements non-essential to the pure expression of the underlying phenomena. As works in their own right, these stand coherent and fully-formed. The starkness of their largely black and white appearance is not a technical limitation, but a facet of the desire to retain clarity as well as a reflection of the underlying simplicity. The techniques used need not necessarily have these austere limitations and indeed can – in different variations, not presented here – incorporate rich palettes of colour. Other uses may also complement more complex environments in peculiarly satisfying ways. In the case of both of the variations displayed here, the process involves video feedback of the form where the results of the previous frame’s rendering are used as visual input to each new frame. This colour value is inverted and rendered onto some simple geometry which remains static while the viewer’s manipulation of the ‘camera’ through which it is viewed changes. The use of colour inversion helps to ensure that the results do not tend to ‘blow out’ or decay excessively as patterns converge or diverge, allowing wide ranging exploration of the space of possible patterns without too often being stranded in featureless desserts. Also crucial to the design of these variations is the use of solid ‘frames’ of pure black (or black with a white stripe), which serve to provide the system with a consistent input signal encouraging the formation of stable patterns. a stable graphical input, while subtly coloured dots appear under users’ fingers; sometimes changing the entire appearance of the image as they are incorporated into the feedback. The variation Cardboard Box Recursion (Android & Cardboard) explores the synthesis of a unique and compelling virtual reality environment distinct from resource intensive graphics techniques that attempt to produce a realistic, representational view of the world. It uses a 3d environment consisting of a cube, with the viewer placed in the center. 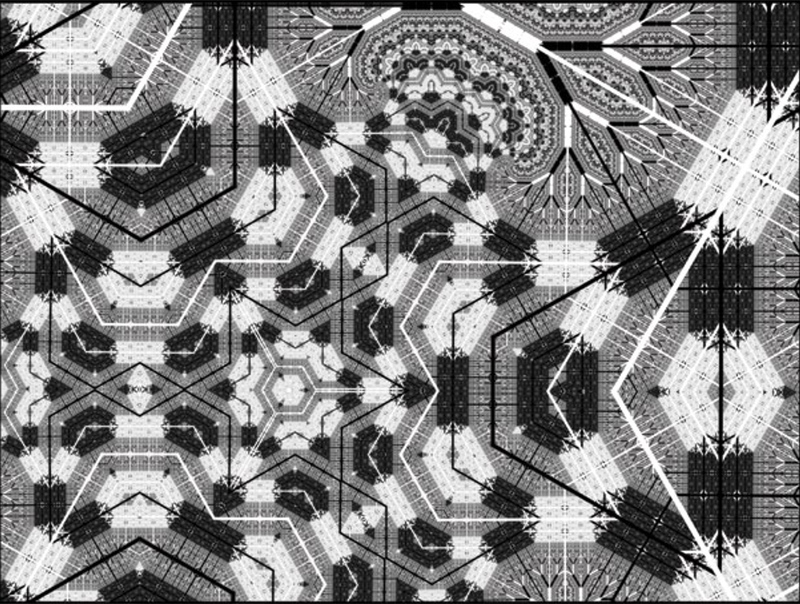 The camera through which the feedback loop occurs uses a damped version of the viewer’s head movements, opening up an expressive dynamic interaction with the chaotic geometries as they unfurl into endless tunnels and spiralling voids. The ‘frame’ consists of a black and white stripe along each of the edges of the cube.